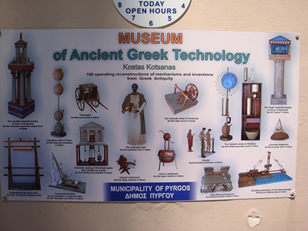 The present exhibition of Ancient Greek technology includes approximately 200 operating models of Ancient Greek inventions. 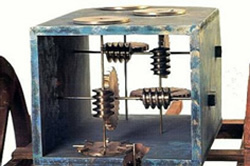 The Ancient Greek technological marvel from the robot – servant of Philon to the cinema of Heron and from the automatic clock of Ktesibios to the analog computer of Antikythera cover the period from 2000 BC until the end of the Ancient Greek world. The aim of the museum is to highlight this relatively unknown aspect of Ancient Greek civilisation and to prove that the technology of the Ancient Greeks, just before the end of the Ancient Greek world, was shockingly similar to the beginning of our modern technology. The bolts and nuts, gears and rules, pulleys and belts, sprockets and chains, block and tackles and winches, hydraulic controllers and valves are just some of the inventions of the Ancient Greeks which were the foundations of their complex technology. 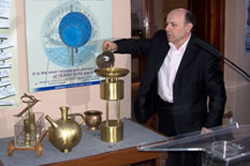 The present exhibition of Ancient Greek technology includes approximately 200 operating models of Ancient Greek inventions. 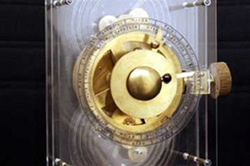 The Ancient Greek technological marvel (from the robot – servant of Philon to the cinema of Heron and from the automatic diary of Ktesibios, the hydraulic clock of Archimedes to the analog computer of Antikythera) covers the period from 2000 BC until the end of the Ancient Greek world. 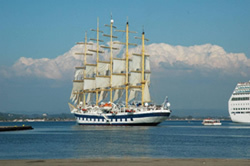 All were constructed by Kostas Kotsanas, through 22 years of extensive research and study. It is the most credible (since it is based solely on the thorough study of the Ancient Greek, Latin and Arabic literature, vase painting information and minimal relevant archeological finds) and the most comprehensive exhibition of its kind worldwide. 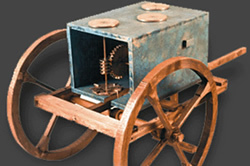 d) had discovered the beginning of the steam engine, the unity of Archimedes, the greater sientist of all times. f) had devised ingenious vending machines,”ispliga” the mechanism avoiding earlier start of athletes. h) had clocks (and alarm clocks) which operated automatically and continuously without human intervention, etc. In front of the museum there is a tree-lined park, which hosts basketball court, a small football pitch and playground. To visit please call 698-3239032.